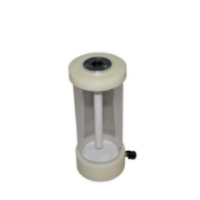 This fluidized mini hopper has size diameter of 4″ wide x 9.5″ tall. The see through tube is made of organic glass and has a fluidizing plate at the bottom. There is an air supply connection at the base below the plate and the powder pump from your gun fits snugly into the grommet at the top. Fits all IntelliCoat guns and will work with any brand gun but may require changing the o-rings on your pump to obtain a tight seal.